Unique statement necklaces for fall - Susan Said... WHAT?! It seems that statement necklaces are here to stay… at least through fall! A quick flip through my new InStyle Magazine confirmed that huge, multi-strand necklaces are still a “fashion do.” From some of my favorite stores like bebe, White House Black Market and Express, with necklaces, it appears that bigger is better! Much as I love a fabulous necklace, sometime they’re a pain in the neck – literally. Several of my chunkiest, multi-strand necklaces are so heavy that I need to take them off mid-day. If you “feel my pain” never fear, I recently found a solution that is both smart and beautiful – from Elizabeth Green’s Couture Crochet. These eye-catching necklaces are actually made of colorful and (most importantly!) lightweight ribbon. Plus, the clever design allows you to easily adjust the length to work with any neckline. My favorite color combination for fall are the brilliant reds, oranges and yellows showcased in the Firefly necklace, pictured. This stunning necklace looks effortless, whether it’s paired with jeans and a tee or a work ensemble. These great pieces are also quite affordable. The Firefly necklace retails for only $16.00 and all of Elizabeth Green’s lovely pieces are available online at Couture Crochet. Photo courtesy of Couture Crochet. 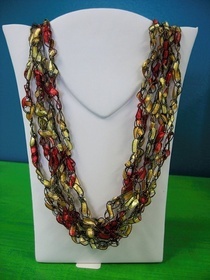 Separator image Posted in WOMEN'S FASHION and tagged with accessories, Couture Crochet, fqashion, jewelry, necklace, statement necklace, WOMEN'S FASHION.